Last year I bought a Better Homes and Gardens Special Interest Publication about this time of year. It was all about vegetables. 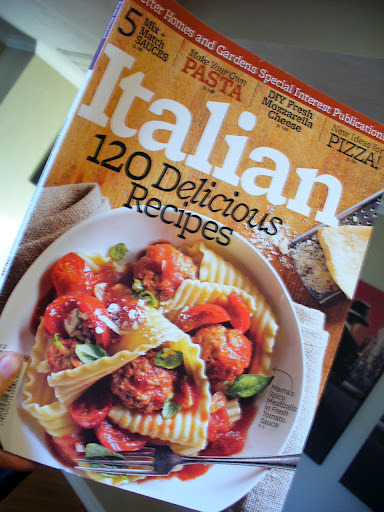 As I thumbed through it I came across several recipes I wanted to try. The first one I made was a veggie pasta. It was delicious! It was easy and customizable to any number of combinations. That recipe inspired many other pasta and veggie dishes since. Another recipe from that magazine was Sausage Stuffed Acorn Squash, which is delicious and I have made several times. I was at the store the other day and saw the most recent edition of the Better Homes and Gardens Special Interest magazine with a delicious looking pasta and meatballs on the front cover. I bought it. Impulse buying at its best! But SO totally worth it! I have already made TWO recipes from this magazine, and like the recipes from last years magazine they are complete winners!! I highly suggest you run down to your local bookstore, or where ever you buy magazines and pick up the current Better Homes and Gardens Special Interest magazine before it is gone! And no, I am not getting any thing from BHG, this is completely my opinion. 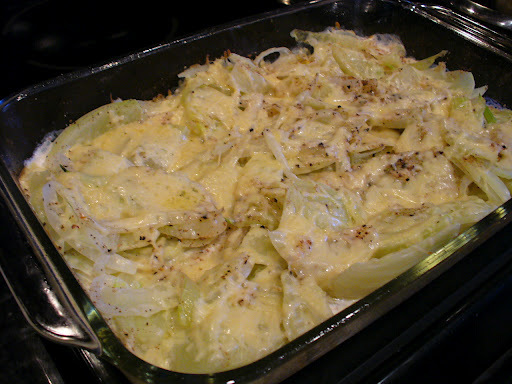 So, the first recipe I made is Baked Fennel with Parmesan. Like the last recipe I made (Fried Green Tomatoes), you kinda have to already like fennel to make this recipe. But, even if you don’t, you should try it because it is delicious!!! Words we used to describe it were: pasta like, meaty, savory, amazing, etc. 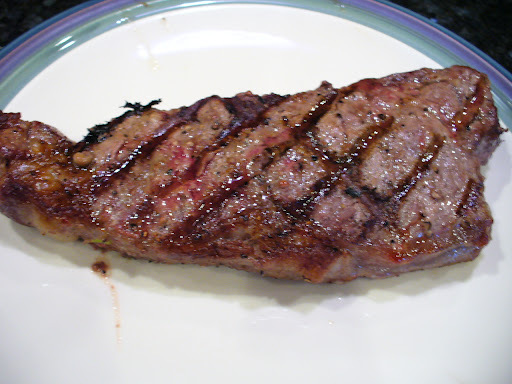 I served this with a grilled NY steak, lightly seasoned with salt and cracked black pepper, topped with grilled mushrooms and alongside a tomato, cucumber, feta salad. The entire dinner came together as an amazingly delicious meal. 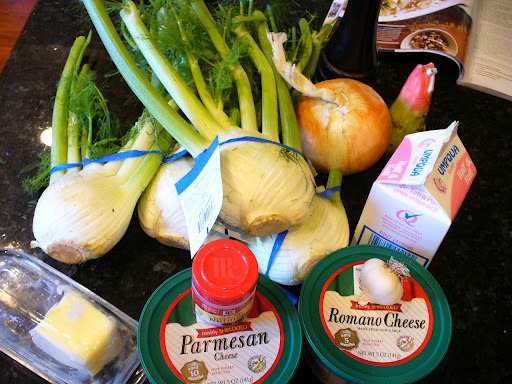 For the Baked Fennel with Parmesan you will need 3-4 medium fennel bulbs, a small-medium onion. garlic, butter, half n half,nutmeg, Parmesan-reggiano cheese, salt, pepper and if you are so inclined, Italian parsley and toasted walnuts. I am not a fan at ALL of walnuts, so I skipped that. Preheat your oven to 425* and put a pretty good size pot of water on to boil. Also, pull out a casserole or other shallow dish and grease it. The recipe calls for butter, but I just used a quick spray of Pam. First, gather all your ingredients together. 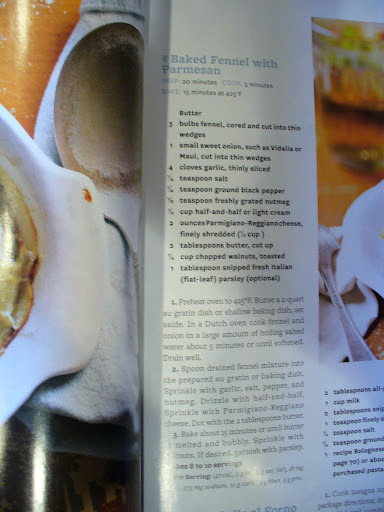 It is hard to find Parmesan-reggiano down here so I used a blend of Parmesan and Romano cheeses. 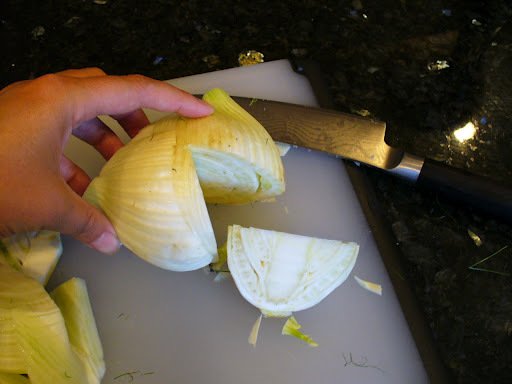 Start with chopping up the fennel into thinish wedges. Whack the bulb end off of the stem. The stems are not normally used, but you can use the fronds (the thin wispy bits) on the stalks like you would any other fresh herb to season the final dish. 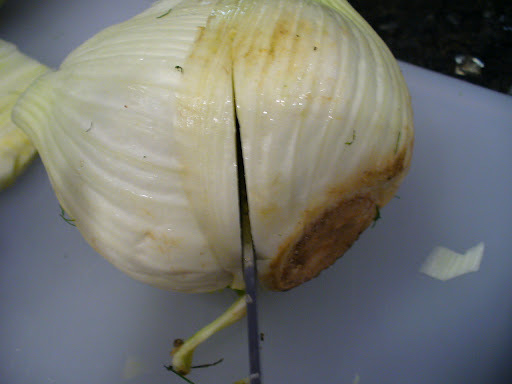 To core the fennel make a diagonal cut just to the outside of the root, and then another on the other side. 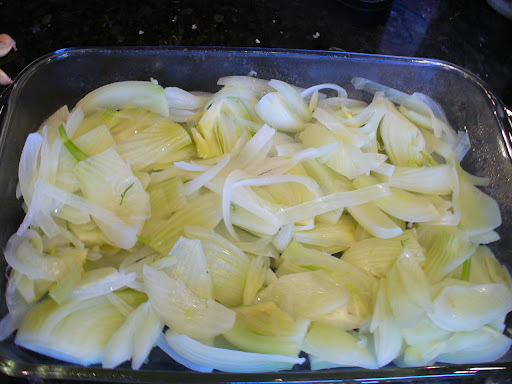 Slice a medium (the recipe calls for sweet, I just used regular yellow) onion into wedges and add both fennel and wedges to a pot of boiling water. Boil for five minutes or so until the fennel is soft. Drain well. Add the cooked fennel and onion to the casserole dish and then pour half n half over the top, sprinkle with nutmeg, and then the cheese. 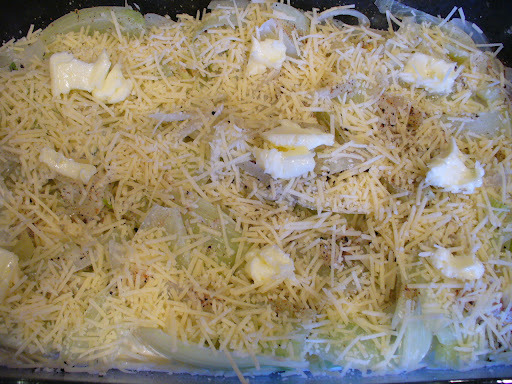 Dot with butter and then bake for about 15 minutes, or until everything is heated through and the cheese is melty. That’s it! Fairly quick and OH SO DELISH! As I said, I paired this with a delicious grilled NY steak, which Chris and I split. I had cooked some bacon earlier in the day and the pan was still on the stove with the leftover bacon drippings in it. 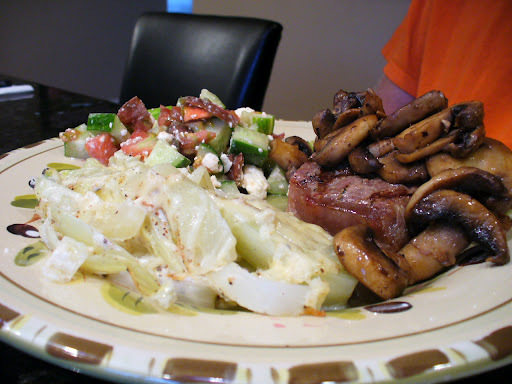 I knew I wanted to saute some mushrooms to go with the steak. Epiphany! 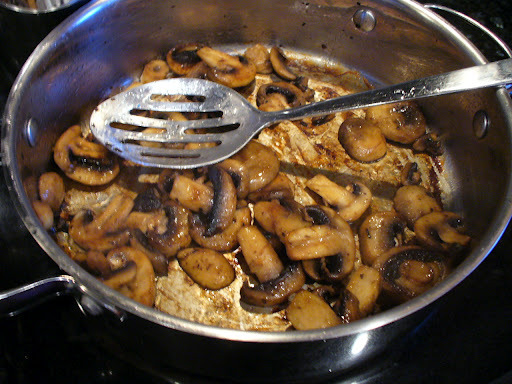 Add the mushrooms to some of the bacon drippings. Oh em gee. SO tasty! Along with that I decided the plate would need a bit more color, and that I have a ton of tomatoes and cucumbers just sitting around waiting to be used. 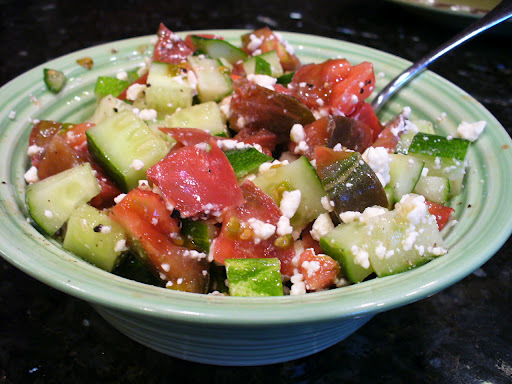 I chopped some cukes and tomatoes threw them in a bowl and added a bit of salt, pepper and feta. Stir it up. Voila! A delicious and colorful, salty, cold, crunchy and creamy side dish. The finished plate looked something like this…. 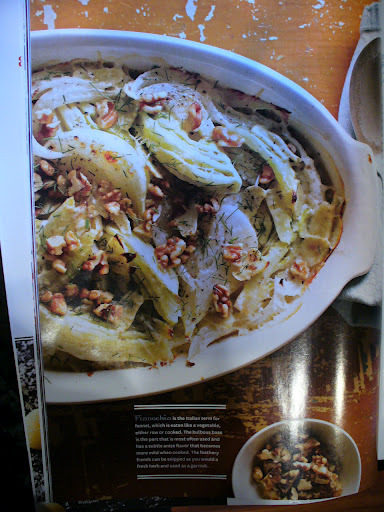 The entire dinner got rave reviews from both of us, but the Baked Fennel with Parmesan is definitely a keeper! Thanks Better Homes and Gardens for the delicious recipe! I can’t wait to make it again. Oh, it is equally delicious warmed up the next day. Yay leftovers! 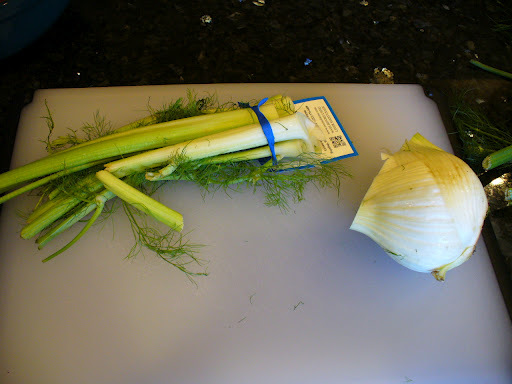 Do you like or loathe fennel? I love it! I have another great recipe for a Steak, Fennel & Arugula Sandwich that is amazing! 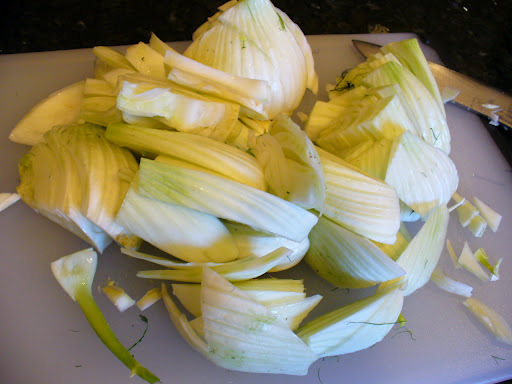 What is your favorite fennel recipe?? 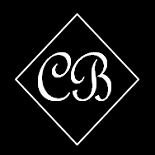 This entry was posted on September 21, 2012 by Corrie Beebe in cooking, food, recipes.